Nationwide, the Army Reserve makes up one quarter of the strength of the British Army and routinely works side-by-side with the Regular Army. The men and women of the Army Reserve have been significantly involved with defensive, humanitarian and peacekeeping operations in Afghanistan, Bosnia, Kosovo, Sierra Leone and Iraq. 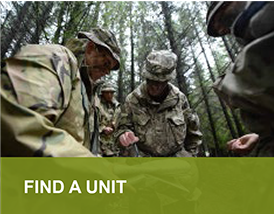 Through Army Reserve training and regular exercises, a range of valuable skills are acquired which can benefit Reservists in their civilian lives. There is plenty of opportunity for overseas travel, and a wide and exciting variety of both adventure training and sport.